How was everyone's weekend? Mine was great! We finally got started on our nursery and although we still have awhiles to go, can I just say how good it feels to have finally cleared out and vacuumed the room? Last night we continued in our spell of motivation and picked out a few paint samples to see what would work best in the room under various lighting conditions. We picked up Whisper Violet which was on my nursery design board, and also picked up Lavender Ice, Iced Lavender, and Violet Dusk. And yes, there is a different between Lavender Ice and Iced Lavender, trust me. We need to spackle and sand the walls before we paint them (we've got a ton of wall shelves that we need to remove since they just won't work with the new design) and then we can start adding furniture and all of the other cute little things I've got stored away for the room. It'll be so nice to finally see all of the things that we've collected for our little girl in her new nursery. I even picked up some yellow velvet baby hangers for her already sizable wardrobe, although I still need to buy some more since I ran out. Oh, and that reminds me. Much to my dismay, Steve is against me wallpapering the inside of the closet (he claims it's too difficult to do ourselves and doesn't want to pay someone to do it), even though I found the PERFECT wallpaper to go in there. 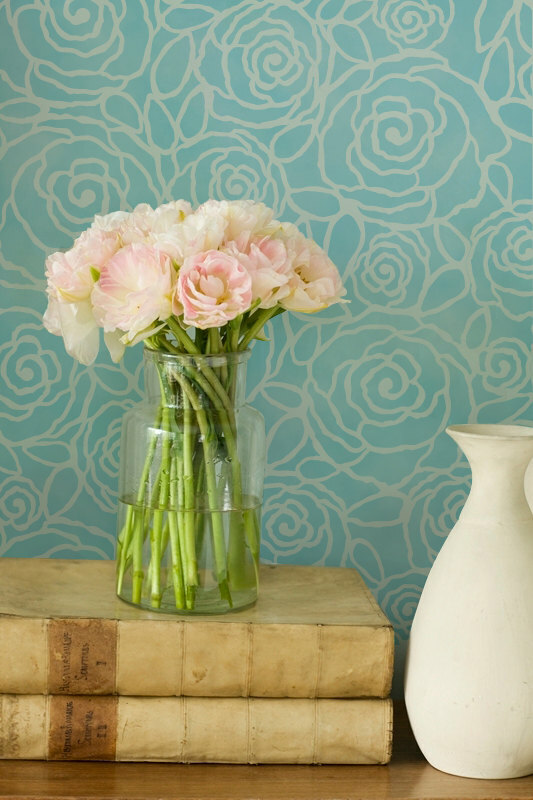 Hygge & West' Petal Pusher in Gold/White would be so perfect, but as a compromise, I've found a wall stencil (Rockin Roses Floral Damask) that is quite similar in pattern and scale to replicate Hygge & West' wallpaper. So, now with this compromise, we are planning on painting the inside of the closet white (it's got the cheap flat builders paint in there - scuff marks galore! ), so all I need to do is find the perfect shade of gold paint and stencil to my heart's content. I'll keep you posted with our progress since I'm sure we'll be working on it some more this weekend. The stencil is very pretty. I want to stencil one wall in my 14 year old daughter's room with a large graphic like the one you chose. Since she's a teen I wanted to go a little glam and do it in metallic gold. I guess I am wondering if you mean a golden yellow or metallic? I love that Petal Pusher wallpaper too! I was so glad to find your blog with the Rockin Roses stencil. I want to create a focal wall in my bedroom with gray background and gold outline of rose. I am concerned about how to do this as I have never stenciled. It seems as if the stencil part that is cut out and will receive the paint is not an outline but larger sections of the flower. I want to order this stencil, but want to be sure I know how to do it correctly. Would you please advise? I had forgotten to mark please notify...I am Caroline with the stencil questions... Did you post pics once you used the stencil or a how to? I searched your blog but didn't see another entry...THANK YOU!